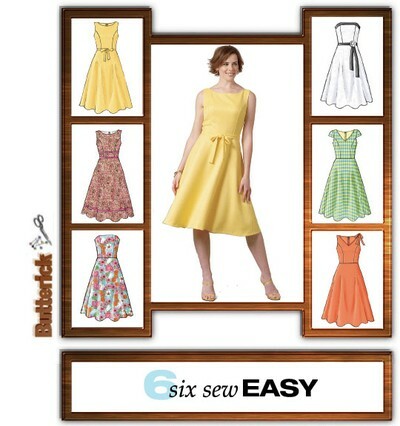 Dress: close-fitting bodice and slightly flared skirt has bodice variations, back zipper and is below mid-knee length. B: contrast band, tie belt and purchased flower. C: tie belt. D: purchased ribbon and bow trim. E: purchased ribbon bow. Notions description...NOTIONS: Dress A, B: One 14" Zipper, Hooks and Eyes. Dress C, D, E, F: One 22" Zipper, Hooks and Eyes. Also for B: purchased One Big Flower and For D: 51/2 yds. of 5/8" Ribbon. For E: 11/2 yds. of 5/8" Ribbon.